On 26 September I took two of our leading fern experts, Paul Ripley (left) and Pat Acock from the British Pteridological Society to the fernier parts of the woods and learnt a great deal myself about how to distinguish one fern from another. So far we have recorded 14 fern species and 2 horsetails (also pteridophytes). These include western polypody (Polypodium interjectum); common polypody (Polypodium vulgare); bracken (Pteridium aquilinum); hart's-tongue fern (Asplenium scolopendrium); lady fern (Athyrium filix-femina); hard shield fern (Polystichum aculeatum); soft shield fern (Polystichum setiferum); scaly male fern (Dryopteris affinis); Borrer's male fern (Dryopteris borreri); narrow buckler fern (Dryopteris carthusiana); broad buckler fern (Dryopteris dilatata); male fern (Dryopteris filix-mas); hard fern (Blechnum spicant); field horsetail (Equisetum arvense) and great horsetail (Equisetum telmateia). Hay-scented buckler fern (Dryopteris aemula) has been recorded in the past, but has not been seen recently, while maidenhair spleenwort (Asplenium trichomanes ssp. quadrivalens) grows plentifully on the bridge in Reservoir Lane opposite the entrance to Rafters Wood just outside the Woodland Trust boundary (see below). Some of the Dryopteris species are quite a challenge, even for the experts. The male fern, the scaly male fern and Borrer's male fern are not easy to tell apart, have many different forms and often produce hybrids. On our field trip we found, for example, one hybrid male fern (Dryopteris x complexa) by the public footpath above Powdermill Stream. The red-stemmed form of the lady fern also occurs here and there. Several of the ferns grow in large numbers in Brede High Woods, but are not all that common in South East England, preferring the damp, sheltered, wooded valleys and gills of the High Weald. Above: hart's tongue ferns (Asplenium scolopendrium on Powdermill Stream bridge. I created this weblog in 2008 with the intention of bringing news of the woods to anyone who is interested. 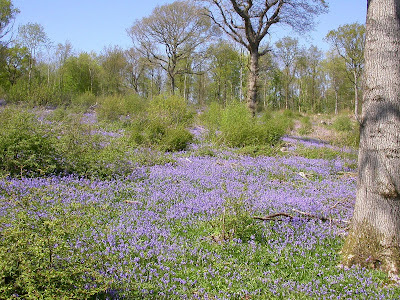 I work closely with the Woodland Trust and am an ecologist by profession, but this weblog is entirely my responsibility, my main qualification being that I live close to the woods and have walked them regularly since the late 1950s.